Tree planter with Engelmann spruce and drywater ready to go! Continuing its decades-long relationship with the Aspen School District, IPF worked with over 130 children from Aspen Middle School and the Aspen Community School planting Engelmann & Colorado blue spruce, Lodgepole & Ponderosa pine, and hundreds of native wildflowers & shrubs from the winter closure gate up to the Top Cut. Planting trees and other forbs offsets carbon emissions, provides habitat and food for native birds and critters, stabilizes slopes de-vegetated by road building and other human activity, improves water quality and soil moisture, and beautifies the corridor. Of equal importance, IPF believes that getting kids outside to dig in the dirt in a service activity that is challenging but fun and produces tangible results is one of the best ways to cultivate young stewards. When kids work with IPF, every time they travel the Pass they look for “their” tree, watch it grow over the years, and feel a sense of pride in their contribution. And maybe they’ll show a six-foot tree to their own children one day. This summer IPF installed a new interpretive sign at the summit, replacing the existing weather-beaten, largely unreadable sign asking visitors to stay on the trail. The new sign features photos of delicate alpine plants, and explains how long it takes them to grow, how susceptible they are to damage by careless feet, and why it is therefore important to stay on the trail. The sign was installed by the ever-capable Buena Vista inmate work crew. IPF also, with the help of landscape architect, Suzanne Jackson, and professor of geology, Garry Zabel, designed an interpretive sign for the popular Grottos day use area, which will be installed in early summer 2019. The sign describes the unique and fascinating geology and natural history of the Grottos, and includes a useful trail map for visitors. The sign will enrich thousands of visitors’ experience at the Grottos for years to come. IPF partnered with the Jaywalker Lodge, citizen volunteers, the Buena Vista inmate work crew, and Glenn Ryan leading the USFS pack string to pull, stack, sort, load, and carry out at least 6,000lbs of rebar, metal cable, and other debris from the Mountain Boy region of the Collegiate Peaks Wilderness. This September project marked the culmination of three years’ work on the top of Mountain Boy and its ridge to the east by IPF and its intrepid volunteers, including many Roaring Fork Valley students. The debris consisted of the remains of the mammoth Continental Divide snow fence experiment, the aim of which was to capture and hold snow, allowing for a more gradual runoff throughout the summer. The project was abandoned midway through construction in the 1960s when scientists determined it wouldn’t work. 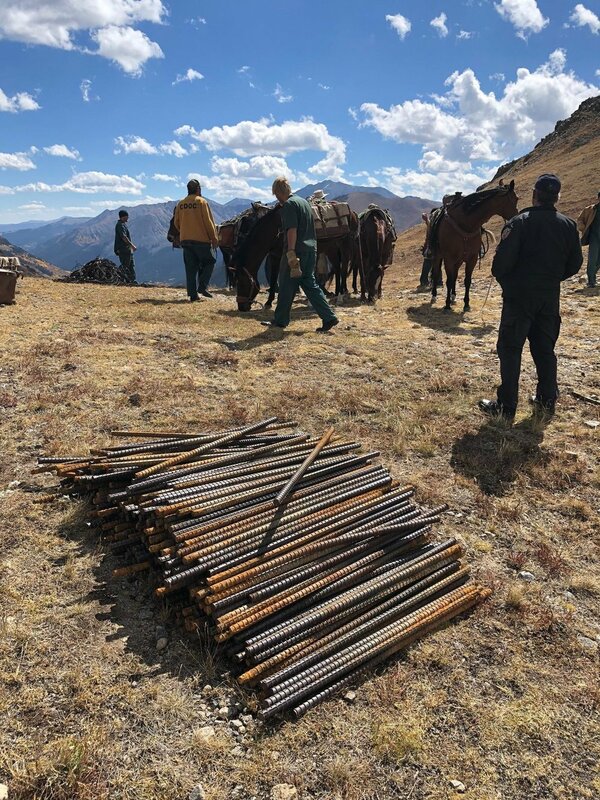 While IPF was able to remove those portions of the snow fence that ran along the summit of Independence Pass by helicopter, the debris in Mountain Boy, because it is in designated Wilderness, can only be carried out by hand or pack animals. This is where the mule team came in. Over three days, 10 mules and horses, two packers, and myriad volunteers and workers led the mules up to the staging area, where their panniers were loaded with rebar and debris, then led down to Highway 82 where the metal was picked up and recycled by the Leadville Ranger District of the Pike-San Isabel National Forest. Earlier in the summer and for the two years prior, volunteers had spent long, hard days first hiking up to 12,500’ in elevation, largely off trail, then pulling, wrenching, and prying the deeply-buried rebar out of the ground. Various tools including high jacks and chains, tree removers, and sledgehammers were employed in the effort. The rebar was then carried by hand or backpack to a staging area reachable by the mules at a pass between Lake Creek to the east and Mountain Boy to the west. This multi-year, physically demanding project has turned out to be a hugely popular and satisfying one for our community’s incredible kids and volunteers. IPF estimates that a couple thousand pounds of rebar still remain in the basin just to the northeast of the summit of Mountain Boy, interspersed in the willows and wetlands of an area affectionately known as “Mountain Girl.” IPF hopes to pull and haul out these last remnants of snow fence from Mountain Girl over the summer and fall of 2019. In 2017, IPF teamed with The Wilderness Land Trust to purchase two mining claims, the seventeen-acre Grandview and Spotted Tail lodes, in the Collegiate Peaks Wilderness. Because these inholdings above the ghost town of Independence carried the right to build a home and be accessed by car, they posed a significant threat to wilderness values. The Wilderness Land Trust is now working with the US Forest Service to make the inholdings part of the Collegiate Peaks Wilderness. This will ensure the property remains free from development and open to the public for all time. It will preserve the existing view plane from the ghost town and from Highway 82. And it will protect migration corridors and habitat for elk and other species, including the rare Colorado plant, Altai cottongrass. This fall, IPF and The Wilderness Land Trust celebrated this win for wilderness with a joint gathering at the site and a talk by local author, historian, and environmental champion, Paul Andersen. IPF continued its efforts to keep invasive weeds at bay by hand pulling species like oxeye daisies, plumeless thistle, and knapweed throughout the summer. It also spot treated (with an organic compound) yellow toadflax, a species that cannot be controlled by pulling and that has taken over hundreds of acres in the Maroon Bells-Snowmass Wilderness. Noxious weeds are plants that have been transported either accidentally or purposefully as ornamentals from overseas. They have an advantage in their new environment because the insects, diseases, and animals that would normally control them are not found here. And as the toadflax seen near the summit of the Pass demonstrates, they are able to adapt to a wide variety of climatic and environmental conditions. As a result, invasive weeds can displace native plants at an alarming rate. When the native plants that wildlife use for food, shelter, or nesting are gone, wildlife leaves the area. And because these weeds’ seeds can hitchhike on vehicles and like to establish themselves in disturbed sites such as roadsides, the Independence Pass corridor is prime territory for invasive species to take hold. By controlling their spread, IPF has committed to protecting the beautiful native wildflowers, plants, and wildlife that call Independence Pass home. The winter closure area five miles east of Aspen, a popular jumping-off point for skiing, snowshoeing, and dog walking when the Pass is closed to cars, got a big facelift between 2016-2018. Specifically, IPF removed the weed-infested berm to the north of the parking area and replaced it with a locally-sourced rock wall and berm. The berm was planted in the fall of 2017 with native grasses, wildflowers, and shrubs. In the spring of 2018 we installed a temporary irrigation system to ensure the new plants’ survival, and planted additional Wild rose bushes, Ponderosa pines, and native wildflowers, all of which will block the view into the CDOT dumping area to the north. IPF also removed the jersey barriers that served as a winter loading dock and replaced them with an attractive board-form concrete wall. We installed an information kiosk with a map of the Pass for first-time travelers. Also, Black Magic Welding graciously fabricated a new winter closure gate to replace the previous graffiti-strewn, ramshackle one. These improvements have helped reclaim the natural appearance of the area and have created a more inviting gateway to the Pass. Finally, IPF’s work at the site allowed CDOT and Pitkin County to utilize the winter gate area as a safe turnaround point for trucks and trailers over 35’ in length. This, in conjunction with a new loop system that CDOT installed this spring across from Difficult Campground that detects and alerts vehicles over 35’, resulted in a reduction in violations of the 35’ rule and fewer closures necessitated by truck blockages or accidents, improving travel and safety on the Pass for everyone. IPF continues its cover composition and phenology studies with ecologists Delia Malone and Dawn Barton, which studies will provide long-term data on the types and number of plants living in the alpine and sub-alpine regions of Independence Pass, as well as their timing of bloom. 2016-2018 data are available by clicking on the buttons below. IPF works to protect the native plants we are studying through its noxious weed eradication efforts (see above), its trail and signage work (to encourage people to stay on the trail and off the fragile tundra flowers, see above), and its citizen science work (to involve the public and enrich their understanding and appreciation of our native plants). As part of its ongoing studies, IPF partnered with the Aspen Global Change Institute to install a monitoring station at the summit of Independence Pass The station, part of AGCI’s valley-wide network, records real-time soil moisture, snow depths, and temperatures at the summit of Independence Pass 365 days/year. Soil moisture is important in helping to determine what plants can live in an ecosystem, and studying it over time can offer clues to how climate change may impact the plants IPF finds in its studies. To see graphs depicting relative soil moisture from 2016-2018 at three different depths, please click on the buttons below. These graphs show soil moisture from August through October. The soil moisture during this period represents water reserves coming out of summer. It also indicates what soil moisture will be once the ground thaws in the following spring, which determines how much melting snow will be absorbed into the ground and how much will become overland runoff. At a 2 inch depth in the soil, 2018 started the fall quite dry, but October rainstorms increased soil moisture later in the season. These rainstorms were not heavy enough, however, to soak down to 8 inches, and soil at that depth remains quite dry as the cold season begins. In addition, the monitoring station at the summit reads snow depth throughout the year. The graphs below show the snowpack across water years, which span from October 1st to September 30th of the following year. Water years are named for the tail end of the season, so Oct 2016 to Sept 2017 is called water year 2017. So far, the 2019 water year has a strong start for snow depth on Independence Pass compared to the prior two years, but as can be seen in 2017, the snow season can change quickly if new snow storms do not continue. When considering water supplies for the plants on Independence Pass and the human communities that live below it, date of snowmelt is important, as well as volume. In 2018, the snowpack melted out nearly a full month before it did the year before. Please note: actual snow data was not available for 4/13-5/15 for the year 2018, so a thin line (or a pale section of the graph) has been added to the graph to represent that snowpack existed during this data gap, although exact depths are unknown. In addition, we installed a time-lapse camera known on the monitoring station to take photographs eight times a day, 365 days a year. Stitched together, the images create a movie portraying the ever-changing conditions at the summit, including the rising and falling snowpack, the emergence of alpine plants in the spring, and the tundra’s changing color from green to gold in the fall. Below is a 1 1/2-minute “movie” of the Pass from October 1, 2017 through September 30, 2018, capturing deer, elk, and even the occasional Homo sapien! Finally, IPF is a proud sponsor of the Front Range Pika Project, a partnership of Rocky Mountain Wild, the Denver Zoo, and the White River National Forest, which is employing citizen scientists to participate in a multi-year study of pikas in our region. This summer, scientists began identifying plots and training volunteers, including IPF’s Executive Director and other IPF volunteers, to collect data on Independence Pass and other alpine locales in the White River National Forest. If you are interested in participating, please contact Karin Teague, director@independencepass.org. On July 21, IPF partnered with Roaring Fork Outdoor Volunteers, Wilderness Workshop, the Aspen-Sopris Ranger District, and dozens of volunteers to build a rock turnpike on the 1/10-mile stretch between the high point of the Linkins Lake Trail and the lake to prevent degradation of this wetland environment. Volunteers also built a rock bridge over the Roaring Fork River on the upper Lost Man Trail and closed off and revegetated the riverbank where social trails had developed. These important projects on two of the most popular trails on Independence Pass will protect the tundra and provide a better experience for hikers for years to come. Forest Service personnel and volunteers move large boulders to create a rock bridge crossing on upper Lost Man.